The Department of Environmental Protection (DEP) has instituted a new statewide alcohol ban in all Connecticut State Park and Forest recreation areas, effective January 1, 2000. The ban will apply to all of the Connecticut's 93 state parks, 28 state forests and 17 state campgrounds. The banning of all alcoholic beverages from state park and forest areas is part of the overall improvement plan to upgrade all state recreation areas. Such a ban has been previously established at thirteen Connecticut state park and forest areas. "The determination for a ban on alcohol has not been approached lightly. It is part of an overall effort to improve services at all state recreation areas and create a consistent set of rules at all state parks," said DEP Commissioner Arthur J. Rocque, Jr. "An alcohol ban has been in place in 13 state recreation areas. Some of the bans have been in place for over 10 years, where it has been met with very positive reactions by park users and campers. " "This is a measure we are taking to improve the park visitor's experience and safety, not an intention to restrict the activities of a park user," said Richard Clifford, Chief of DEP's Bureau of Outdoor Recreation. "Black Rock State Park in Watertown and its campground are excellent examples of the success of an alcohol ban. No alcohol has been allowed at Black Rock since 1989 and it has dramatically improved the atmosphere of the park. Law Enforcement issues at the park dropped significantly and park visitors welcomed the change," said Clifford. DEP statistics show that 25 percent of the arrests and infractions issued in state parks during the 1999 recreation season involved the use of alcohol, a 7 percent increase over the 1998 figure. Additionally, increased visitor complaints, alcohol related drownings and near drownings provided compelling reasons to impose the alcohol ban. Simple truth right from 'internal' DEP is no alcohol=very few visitors=less work to do..... Alcohol bans are also in effect at state parks and forests in the states of Massachusetts, Rhode Island and New Jersey with successful compliance and no negative impact on attendance. [[ Not enforced but otherwise a total LIE ]] "Along with providing the parks with new bathhouses, toilet buildings, roadways, increased handicapped access, new sewer and water systems and a new automated campground reservation system, the alcohol ban will create a more welcoming family atmosphere and improve the park experience," said Rocque. The ban on alcohol does not apply to individual state boat launch areas or wildlife management areas managed by the DEP. It does apply to state boat launch areas located within state parks (See Fact Sheet). Exceptions to the alcohol ban apply to the following state parks, but only through previously arranged rental agreements and or special use licenses; they are Harkness Memorial State Park, Waterford ? Use of the Eolia mansion through a rental agreement; Rocky Neck State Park, Niantic- Use of the pavilion through a rental agreement; Throughout the state park system at the discretion of the Commissioner of the DEP through Special Use license for charitable and other special events. Connecticut State Parks and Forests Alcohol Ban Effective January 1, 2000, all alcoholic beverages are prohibited at all Connecticut State Parks, Forests, Campgrounds and State Boat Launch Areas located within State Parks and Forests. 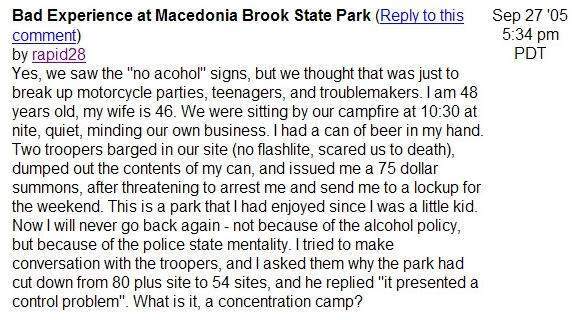 You are correct that we do not allow alcohol in the state forests and parks. To my knowledge, we are not checking trunks upon check in but if a situation arises where campers are blatantly drinking alcohol, then our park staff or park rangers will take action. Again, to my knowledge, we have not been overly aggressive in chastising our visitors for having a beer or a glass of wine with dinner at their immediate campsite as long as it is not conspicuous. This policy is in place to avoid the excessive consumption of alcohol that has occurred for years at our campgrounds. To curb this behavior, which was driving away families from staying in our campgrounds, we had to ban it. This has been a policy for a few years now and we have found it to work very well in ensuring that ALL campers have a good experience in our state forests and parks campgrounds and that one or two rowdy parties do not spoil it for the rest of the campers. Click above image for larger view. This is an example of the treatment to 100% of visitors. Visitors ARE CONFUSED because I believe most states have the same NO ALCOHOL policy but do not enforce it or only when needed.